The vision for the Illawarra-Shoalhaven region is for a sustainable future and a resilient community, capable of adapting to changing economic, social and environmental circumstances. Residents will be able to access a range of lifestyle choices; connect with the stunning landscapes and biodiversity; access well-established and emerging work opportunities; enjoy a strong network of centres; and experience high-quality education and health facilities. At the economic and cultural heart of the region is Metro Wollongong – a nationally significant city. Much of the future prosperity of the region will be built on the potential to generate jobs from the integration of education, health care, business and tourism precincts in Metro Wollongong. Building a strong, diversified economy is a priority because it will enable the community to respond to environmental, economic and social challenges. A strong economy will generate the high-quality jobs that will retain and attract young people and university graduates. It will enhance the region’s centres and public spaces and offer interesting cultural and recreational experiences that will increase the appeal of the region as a place to live, work and invest. Delivering more diverse housing in sustainable locations will meet the needs of singles, families and the aged, help to satisfy the demand for student and visitor accommodation, and contribute to greater housing affordability. Energy- and water-efficient house design, and neighbourhood design that encompasses landscaping, and walking and cycling paths, will be prioritised to promote social inclusion, community wellbeing and environmental sustainability. The funding and timely delivery of infrastructure will be critical to underpinning economic and housing growth across the region. The introduction of high-speed broadband will promote employment opportunities at home, enhance the efficiency of business, and improve the region’s connections to Sydney and other markets. Community infrastructure such as parks, cycle paths and public transport will make moving around the region and enjoying its recreational opportunities much easier. Positive regulatory settings and policies that overcome barriers to investment will help the region to grow and flourish. The benefits of growth will be used to protect and restore the environment and build its resilience to cope with challenges from natural hazards and climate change, and to rebuild disadvantaged communities. a region that protects and enhances the natural environment. This vision will be achieved through this Plan and is encapsulated in the Illawarra-Shoalhaven Regional Plan Strategy Map. Having grown up, lived and worked in the Illawarra and Shoalhaven my entire life, I know our region‘s greatest asset is our local people. But Governments have an obligation to look beyond the horizon to identify the opportunities and challenges that will confront the future of our region. By 2050 the population of the Illawarra- Shoalhaven will be around half a million people. The region is home to one of Australia’s top 10 universities and an international trading port, comprises a landscape of significant biodiversity value, and delivered $16.2 billion in economic output to the State in 2013 – the Illawarra and Shoalhaven is a region of national significance. Over 40 per cent of the region has recognised high environmental value, and agricultural productivity and resources are economically and environmentally important to the region. The community has a strong attachment to the landscape as it allows residents to experience some of the most enviable lifestyles in the State. Together with productive and diligent businesses, thriving centres, a skilled workforce, and proximity to the nation’s only global city of Sydney make the region an attractive place to live for current residents and a contributing factor in the forecast growth of this region over the next 20 years. 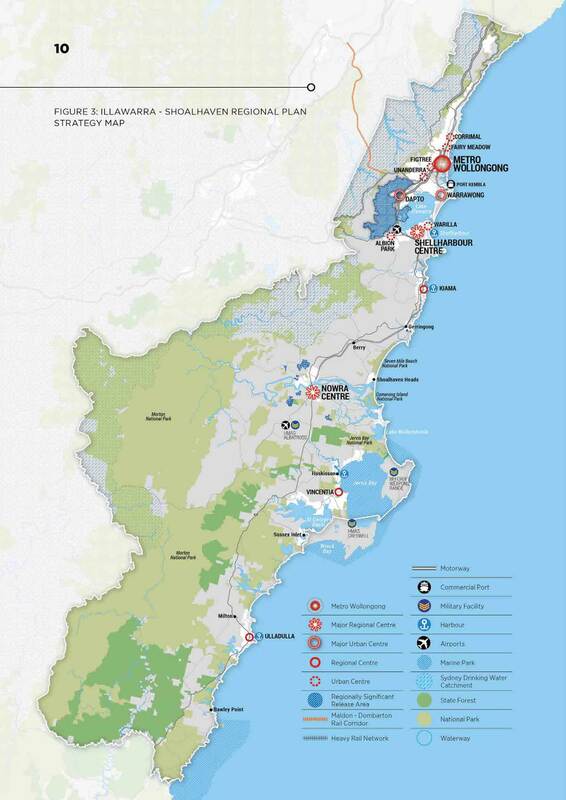 The Regional Plan for the Illawarra-Shoalhaven is a plan for a sustainable future, founded on a strong, diversified economy that will generate high quality jobs; housing that meets the changing needs of the community; a healthy, resilient environment capable of meeting challenges such as climate change; and a well- connected and socially cohesive community. It aims to build a resilient community that is capable of adapting to changing social, economic and environmental circumstances as well as embracing innovation and future growth and development. A distinct difference for this new Plan for the region is the partnership between the NSW Government and the local community through the Illawarra Pilot Joint Organisation. This partnership will oversee the Plan’s implementation and delivery. This is an evidence-based plan, predicated on a sound understanding of both the historical and current development of the region and the demands of population growth. It will deliver on community expectations that growth should be matched by more housing, jobs, business development and growth, infrastructure and services whilst balancing the need to protect what’s special about the environment of our region. I want to thank community members and stakeholders for their contributions and participation in the discussion that accompanied the Discussion Paper, the draft Plan and now this final Plan. The next phase of work is equally critical and I hope all levels of government, the community and stakeholders will work collaboratively to implement the Plan. We all share a common goal for a prosperous future for the community of the Illawarra-Shoalhaven with this plan to serve as a vehicle to help harness the potential of a vibrant, diverse and aspirational region. The Illawarra-Shoalhaven Regional Plan applies to the local Government areas of Kiama, Shellharbour, Shoalhaven and Wollongong. The defining feature of this region is the landscape. The spectacular escarpment, coastline, waterways, lakes and rural hinterlands have contributed to the region’s rich biological diversity and natural resources. The region is home to an estimated 1,800 native plant species, including over 60 threatened plant species and over 100 threatened animal species. Biodiversity corridors extend from the Woronora Plateau in the north, along the eastern escarpment and south along the coastal forests – interconnecting at intervals with other high-value areas, such as Jervis Bay. Underlying the social, economic and environmental importance of the escarpment is that it also contains the water catchment that provides the drinking water for almost 60 per cent of the State’s population. The aboriginal communities of the Illawarra-Shoalhaven retain strong cultural connections to the region’s coastline, hinterland and escarpment. The landscape has concentrated settlement into a narrow strip of suburban communities and coastal towns, focused on the transport corridors in the north of the region. The combined urban area of Wollongong and Shellharbour represents one of the top 10 largest urban areas in Australia. In the Shoalhaven, settlement is more dispersed – across 49 towns and villages. By 2036, the population of the Illawarra- Shoalhaven is forecast to grow to 463,150 – an increase of 60,400 from 2016. Population growth will result from natural increase as well as the sustained migration of young families and retirees looking to take advantage of the lifestyles on offer. The make-up of the population will change over the next 20 years. Growth will be moderate in most age groups, except in the 65-and-over group, particularly in Kiama and Shoalhaven. There will also be more one- and two-person households. Growth will necessitate at least 35,400 new homes. This Regional Plan for the Illawarra-Shoalhaven provides the strategic policy, planning and decision-making framework to guide the region to sustainable growth over the next 20 years. The Plan will be used to drive economic growth in the region. It integrates economic, social and environmental considerations in the interests of achieving ecologically sustainable development for the region. The Plan makes developing a strong, diverse and competitive economy central to building prosperity and resilience in the region, to meet any economic, social and environmental challenges that arise. It focuses on a sustainable built environment that requires urban areas to be designed, planned and managed to improve their environmental performance. In doing so, it will make efficient use of urban lands, promote energy efficiency and support healthy and vital communities. The Plan adopts a balanced approach to growth that maximises development in both existing urban areas with their access to jobs, services and transport, and new urban areas that will be designed to support sustainability and healthy communities. The Plan is the product of comprehensive community engagement and a strong evidence base. Wide-ranging engagement activities helped to identify community, Council and stakeholder issues and aspirations for the future of the region. The feedback from stakeholder workshops, community forums, community surveys, social media, and online and written submissions from the exhibition of the Discussion Paper in 2013 and the draft Plan in 2014 have been invaluable in informing the Plan. The implementation of the goals, directions and actions outlined in the Plan will require the ongoing cooperation and collaboration of the community and all stakeholders. The Plan is also underpinned by a strong evidence base. Data and evidence has been gathered and analysed about population growth and change, the regional economy, the housing and employment market, the location of important environmental and resource areas, and natural hazards. Infrastructure for Illawarra’s economic future (2014). A range of Government plans have helped to inform the Plan, including the State Infrastructure Strategy (2012), the NSW Long Term Transport Master Plan (2012), the NSW Freight and Ports Strategy (2013) and the Illawarra Regional Transport Plan (2014), as well as specific agency plans like Sydney Water’s West Dapto Urban Release Area and Adjacent Growth Areas (2012). The work of other stakeholders has also been of value, including Councils’ Community Strategic Plans and Regional Development Australia Illawarra’s Transition Illawarra Project, and the Regional Development Australia Far South Coast Strategic Regional Plan 2012-2017 (2010). Achieving the vision and goals of the Plan requires leadership and commitment, and ongoing collaboration with all stakeholders, as well as a clear delivery framework. The delivery of the Plan will be overseen by a Coordinating and Monitoring Committee (see Coordinating and Monitoring Committee infographic below) to be jointly chaired by the Department of Planning and environment and the Illawarra Pilot Joint Organisation (JO). The Illawarra Pilot Joint Organisation, as a uniquely placed regional authority will use the plan to argue for the achievement of its goals and directions across Government. The Coordinating and Monitoring Committee will oversee and coordinate the implementation of the Plan. It will also have representatives from the four local councils, the Department of Premier and Cabinet, Transport for NSW, NSW Health, Department of Industry and the Department of education. This brings together the agencies and organisations responsible for delivering the majority of proposed outcomes under the Plan. a summary of the Plan’s actions and responsibility is provided in appendix B.
a five-year review of the Plan or as necessary, to update and revise it. The infrastructure context in this Regional Plan is drawn from the NSW State Infrastructure Strategy, NSW Long Term Transport Master plan, Illawarra Regional Transport Plan, NSW Freight and Ports Strategy, Shoalhaven Water’s servicing plans, and Sydney Water’s integrated water-servicing strategy for West Dapto and adjacent growth areas (including Calderwood and Tallawarra) and its Growth Servicing Plans. Work done by both Infrastructure NSW and Regional Development Australia Illawarra on the economic growth sectors in the region has also informed infrastructure planning. The Plan aligns regional economic and housing outcomes to existing and planned infrastructure investments, so that State funding through the budget process continues to align with priorities and opportunities that support regional growth. Opportunities for private sector delivery of infrastructure will also be investigated to encourage innovation in the provision of growth infrastructure. The NSW Government will continue to work with infrastructure providers to coordinate delivery of infrastructure that meets community needs. coordinating the roll-out of the infrastructure required to support development of priority growth areas, such as West Dapto and Nowra-Bomaderry. This Regional Plan will be implemented through a mix of mechanisms including local planning controls (for example, capacity for housing), regional collaboration (for example, supporting priority growth sectors) and specific projects (for example, infrastructure coordination). The implementation of these actions will be the responsibility of the NSW Government, the four local Councils and the Illawarra Pilot Joint Organisation (JO). The Minister for Planning will issue a local planning direction under section 117 of the environmental planning and assessment act 1979 to require that planning proposals and reviews of existing planning controls are consistent with the requirements of this Plan. A number of actions require a regional approach and collaboration on projects and/or processes; for example, biodiversity certification, sustainable development of centres and whole-of-government policy alignment. Councils will be expected to lead and/or participate in relevant initiatives such as urban design and public domain improvement projects. The NSW Government will use the Regional Plan, along with the annual monitoring of development activity through the Illawarra Urban Development Program, to advise infrastructure agencies about the timing of new investments.